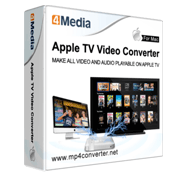 4Media Apple TV Video Converter for Mac can convert almost all video formats like AVI, WMV, MPG, ASF, DAT, VOB, MPEG to Apple TV MP4, MPEG-4, H.264/AVC, MOV, MP3 and M4A, and also convert various audio formats to Apple TV MP3, M4A audio as expert Mac Apple TV converter. Committed to converting Apple TV videos for Mac users, 4Media Apple TV Video Converter for Mac can convert most video formats like AVI, MPEG, WMV, VOB, MPG, ASF, DAT, VOB to Apple TV MP4, MPEG-4, H.264/AVC, MOV videos to give you a luxuriant visual feast with Apple TV. You'll get the same colorful music enjoyment by converting these video files and AAC, AC3, WAV, AU, MP3, WMA, MP2 audios to Apple TV MP3, M4A audio. Besides converting to Apple TV MP4 video, this Apple TV video converter Mac software is also an expert Mac MP4 video converter for MP4 video players. And you can trim video to get the exact segment you want, adjust the bit rate, frame rate and so on to output custom files. Put your video collection on Apple TV with 4Media Apple TV Video Converter for Mac now, and enjoy the brand-new digital entertainment life with Apple TV. 4Media Apple TV Video Converter for Mac is specialized in converting AVI, MPEG, WMV, VOB, MPG, ASF, DAT, VOB video formats to Apple TV MP4, MPEG-4, H.264/AVC, MOV videos to enrich your Apple TV movie library. Get MP3, M4A audios from various video formats for enjoying movie music through Apple TV, iPod and iPhone with the Mac Apple TV converter. The Apple TV converter Mac software can also convert AAC, AC3, WAV, AU, MP3, WMA, MP2, etc. to Apple TV supported audio MP3, M4A. CD decoding is supported. Offering Multithreading and batch conversion, this Mac Apple TV video converter can convert videos at up to 400% conversion speed, and the conversion speed increases with the power of your Mac. 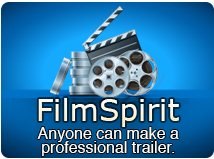 If you want to remove the ads, special features and trailers from the source file, just trim it by setting begin and end time to reserve the part you want only. In the Apple TV converter for Mac, you can just set duration and start time in the advanced settings to pick up any segment for converting with unwanted parts removed. There're a lot of settings for you to customize output Apple TV files: codec, bit rate, frame rate, aspect, sample rate, etc. With 4Media Apple TV Video Converter for Mac, you can preview the input file before conversion to find the part you want, and take snapshot anytime you find an attractive picture. The built-in player is resizable. Checking the parameters of the source files helps to your Apple TV video conversion. 4Media Apple TV Video Converter for Mac offers English, French, Germany, Spanish, Japanese, Chinese interface languages for different mother-tongue users. How to convert videos to Apple TV format on Mac?